John Paul Hunter is at home on the water, having grown up on Cuttyhunk Island. An ambitious entrepreneur, he obtained his license, purchased Seahorse and began transporting passengers for Cuttyhunk Water Taxi in May of 2001. He looks forward to another successful year in business! Rates are based on the number of passengers travelling on that particular trip. Rates shown are for ONE-WAY travel between New Bedford and Cuttyhunk. * Please understand that spiking fuel cost may cause rates to increase. With 5 or more passengers, the rate for children under 12 is $20.00/pp. All fares include two carry-on items. Additional freight will be charged for at the discretion of the Captain. Any special trip after 2 in one day will be priced separately from this schedule at the discretion of the Captain. Travel with comfort and convenience aboard Cuttyhunk Water Taxi's 18-passenger vessel Seahorse. 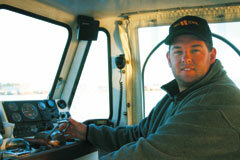 Owned and operated by licensed Captain John Paul Hunter, Seahorse is a Coast Guard-certified, custom-built BHM. Now offering trips to and from Menemsha, Martha's Vineyard and Cuttyhunk. Trip time: approximately 1 hour. Although her regular route runs between New Bedford and Cuttyhunk Island, Seahorse is available for private charter to your local destination of choice. All trips are scheduled by appointment. For information or to book a trip, please call (508) 789-3250. The Cuttyhunk Ferry Company, Inc. is a passenger and freight service to Cuttyhunk Island owned and operated by Captain Jono Billings and his wife, Sue.